The juicer that Jack LaLanne always dreamed about has arrived! The Jack LaLanne 100th Anniversary Fusion Juicer combines high performance with sleek, modern design to make your juicing experience better than ever. This modern, large capacity two-speed juicer has an extra large round feeder to accommodate most fruits and vegetables. Its stainless steel blades and patented extraction technology extracts as much vitamin and nutrient-rich juice as competing juicers that cost many times more. And the super convenient pitcher(included) ensures that you get every last drop of goodness from your fruits and vegetables. So raise a healthy glass of juice to Jack! 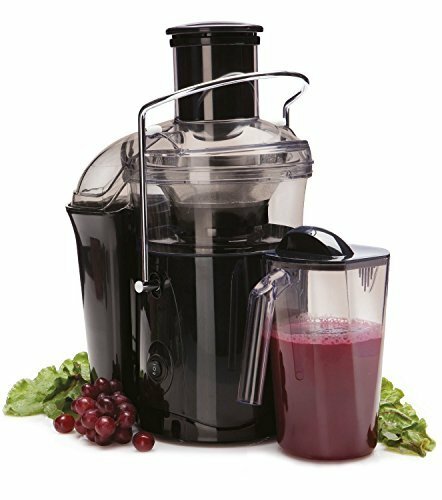 And enjoy juicing like never before with the Jack LaLanne 100th Anniversary Fusion Juicer. Features: Extra Large Chute The extra-large round chute lets you juice most fruits and vegetables whole - no peeling, cutting, chopping, or coring, saving you time! Stainless Steel Blade The stainless steel blade is engineered to juice even the most difficult fruits and vegetables in just seconds. Non-Drip Juice Spout & Serving Pitcher The Fusion Juicer features the convenience of a non-drip spout. After juicing, simply lift up the spout in the upward position to avoid any messy dripping. Clear juice pitcher and lid for no mess serving. Dishwasher safe. If you have any questions about this product by Jack LaLanne's, contact us by completing and submitting the form below. If you are looking for a specif part number, please include it with your message.